I have an inner circle of trusted recipes. As with an inner circle of friends, each has its own personality, and I rely on it for different reasons. There’s the chic recipe I call when I need to impress my in-laws; the laidback recipe I dial when my week’s been crazy and cooking anything more advanced than a frozen pizza sounds exhausting; the romantic recipe that helps set the mood for date night in. Then, there is the rare, beautiful recipe that I can depend on for anything at all. 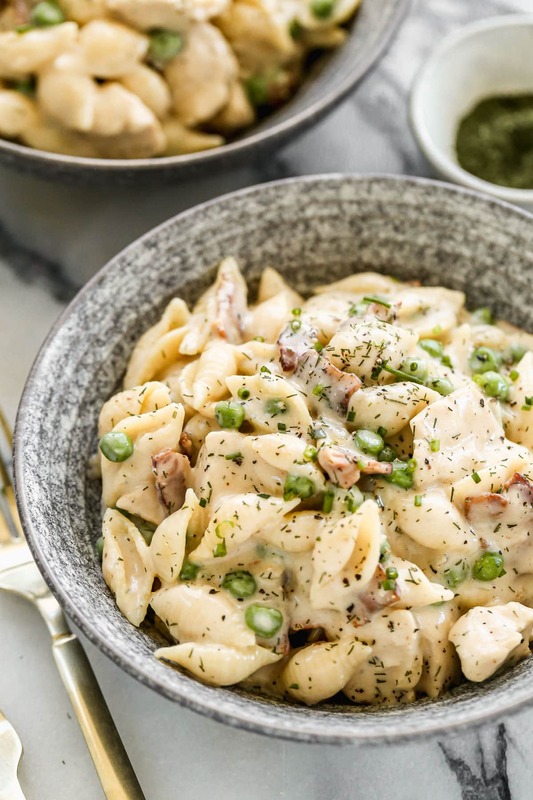 This Creamy Chicken Bacon Pasta with Peas is one of those special finds. 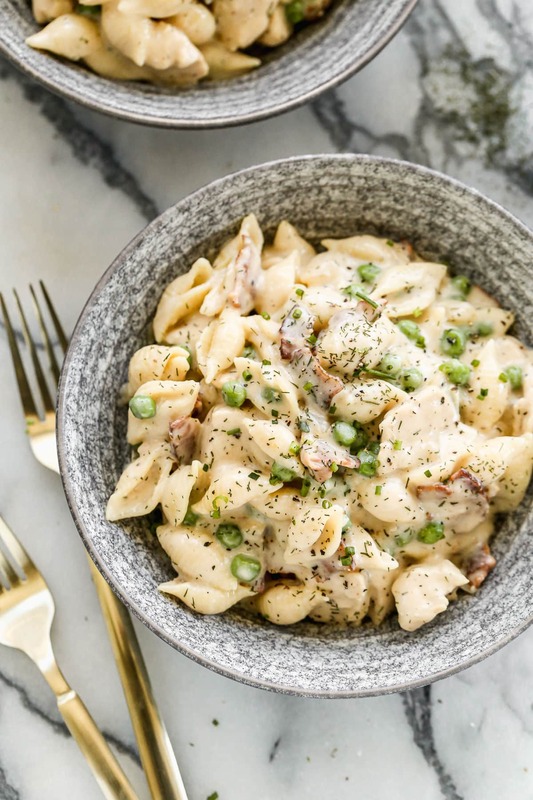 Ready in 30 minutes and stirred together in a single skillet, Creamy Chicken Bacon Pasta with Peas is easy enough for a busy weeknight, but its artful balance of flavors makes it better than many meals I’ve ordered in white tablecloth Italian restaurants. Like all great Italian dishes, Creamy Chicken Bacon Pasta excels at being simple and sophisticated at the same time. Creamy Chicken Bacon Pasta offers mega crowd appeal. You know that friend who is adored everywhere she goes, manages to score free drinks from the bartender, and is magically upgraded to first class on overbooked flights? Creamy Chicken Bacon Pasta is that friend. You can’t help but love it. Whether you serve it to your picky kids or discerning boss, Creamy Chicken Bacon Pasta will be met with clean plates and requests for seconds. 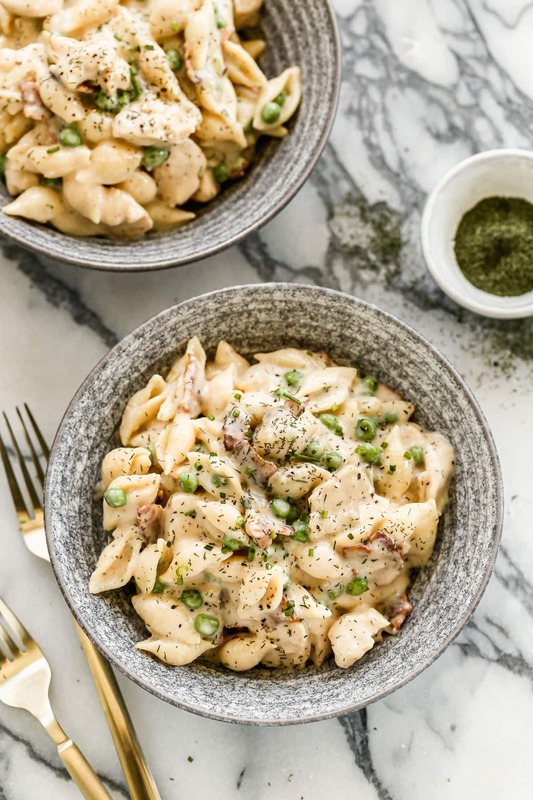 Its wide appeal stems from a masterful combination of comforting, universally-adored ingredients—bacon, juicy chicken, gooey cheese, and a splash of cream—with light, wholesome ones that balance the dish and bring it to life: spring peas, Italian herbs, and DeLallo whole wheat pasta. Although I heartily support a little indulgence here and there, for me, a critical aspect of enjoying a healthy diet is to make simple swaps that increase the nutritional value of a recipe, without compromising its flavor. One of the easiest changes you can make to instantly improve your diet is to use whole wheat pasta in place of white. It’s higher in fiber, and if you choose the right brand, not even your fussiest eaters will notice the substitution. In my quest to convert all those around me to eating more whole grains, I’ve tasted every brand of whole grain pasta I could find, and DeLallo is by far the best. Not even my Italian mother-in-law (who previously regarded whole wheat pasta as the culinary equivalent of cardboard) could detect the difference when I served her Mozzarella Meatball Casserole made with DeLallo’s Organic Whole Wheat Rigatoni. She flat out didn’t believe that I’d used whole wheat pasta, until I showed her the package. 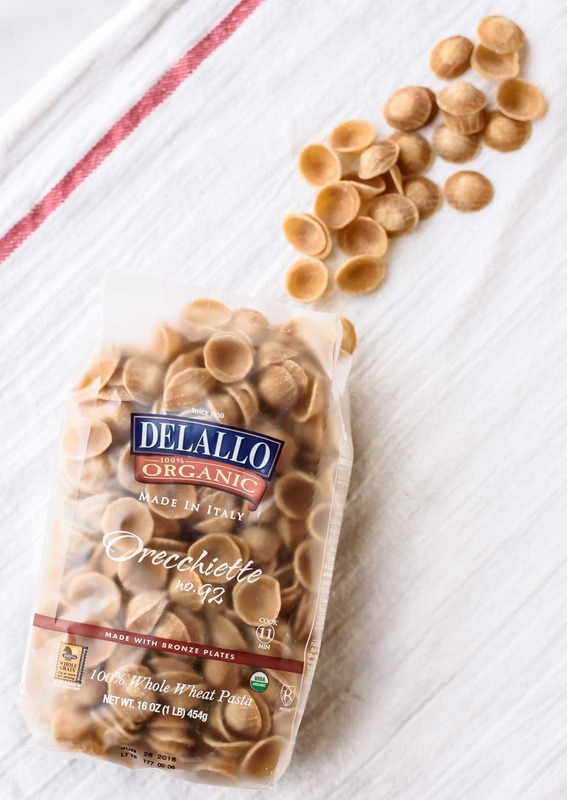 DeLallo offers a wide range of fun whole wheat pasta shapes. You’ll spy the shells in my Spinach and Artichoke Mac and Cheese, the farfalle (bowties) in my Sun Dried Tomato Pasta, and even more in the pasta section of my recipe index. I picked the Organic Whole Wheat Orecchiette for today’s Creamy Chicken Bacon Pasta. 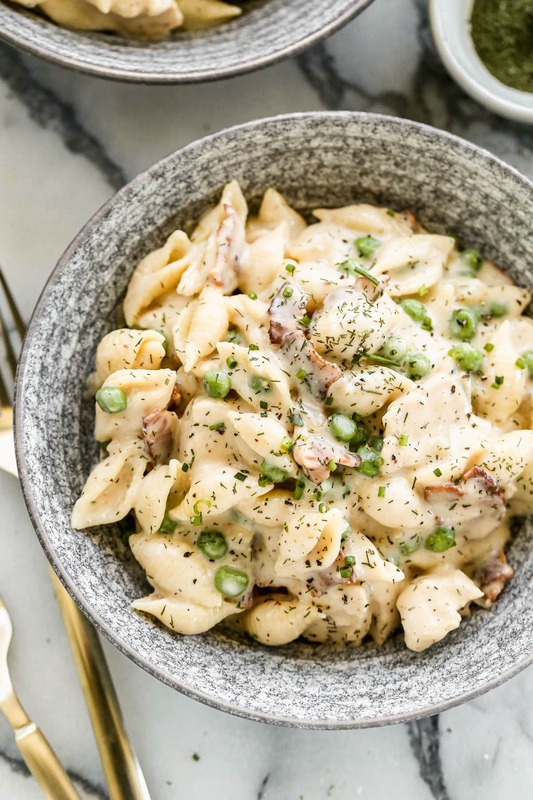 I adore the way the peas and bits of bacon nestle into each of these “little ears” and how the creamy sauce clings to the pasta’s lightly ridged exterior. Every forkful guarantees tasty morsels. 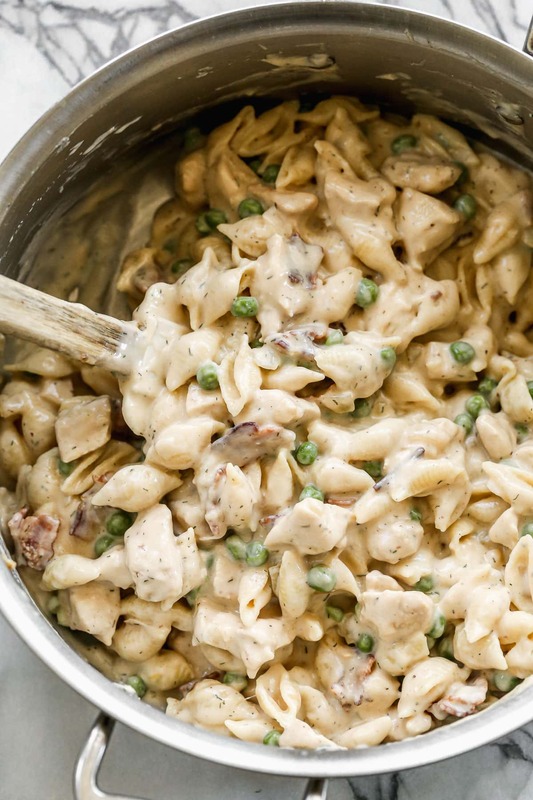 I don’t often beg readers to make a specific recipe—I truly love them all, so doing so feels a little like playing favorites—but this Creamy Chicken Bacon Pasta with Peas is an exception. I emphatically implore, beseech, and yes, beg, you to give this pasta recipe a go. Whether you need a fast supper for tonight or a winning meal to serve friends over the weekend, you can rely on Creamy Chicken Bacon Pasta to be a trusted partner in delectable dinner crime. This creamy chicken pasta is a perfect mix of decadence and fresh ingredients. With Italian chicken, bacon, and whole wheat pasta, this dish is a guaranteed crowd-pleaser and comes together in 30 minutes. Cook the pasta in a large pot of salted boiling water until al dente, according to package instructions. Reserve 1 cup of the pasta cooking liquid, then drain and set aside. Meanwhile, in a large pan with high sides or a Dutch oven, cook the bacon over medium low heat, stirring occasionally, until browned and crispy, about 8 minutes. With a slotted spoon, carefully remove the bacon to a plate and with a paper towel and lightly pat dry. Discard all but 1 tablespoon bacon grease from the pan and return to heat. Increase the heat to medium high, add the chicken pieces, then sprinkle with the Italian seasoning, salt, and pepper. Sauté the chicken until cooked through, about 6 minutes, then add the minced garlic and cook until fragrant, about 30 seconds. Remove the chicken to the plate with the bacon, then return the pan to the heat. Add the half and half to the pan and bring it to a gentle boil over medium high, stirring often. Watch the pan carefully. As soon as the half and half barely begins to boil, reduce the heat to low and add the Mozzarella and 1/2 cup Parmesan cheese. Cook and stir the sauce until it thickens and the cheese melts, about 1-2 minutes. Stir in the pasta, bacon, chicken, peas, and parsley. Cook 30 additional seconds to warm through. If the sauce seems too thick, add a bit of the reserved pasta water to loosen it. Enjoy warm, topped with additional Parmesan cheese and parsley. Leftover Creamy Chicken Bacon Pasta can be stored in the refrigerator for 3-4 days. Reheat gently in the microwave, splashed with a bit of water, chicken stock, or additional half-and-half to keep it from drying out as your rewarm it. I’m pleased to be sharing this post in partnership with DeLallo. As always, all opinions are my own. Thanks for supporting the brands and companies that make it possible for me to continue creating high quality content for you! Sounds delicious! We make something very similar with bechamel, chicken and cauliflower and my two year loves it. I will have to try this version this week, I think she’s going to like! Cauliflower sounds wonderful Ana! I’m going to have to try it myself that way next. Such a fan. That pasta is gorg! I’m swooning over this beautiful bowl of pasta! It really does sound perfect for almost any occasion – and of course, the bacon makes it better :) must try this soon! Had everything I needed to make this at home, so we went for it. OMG SO GOOD!!! I added some asparagus because we had it leftover. I can see making different versions of this with all sorts of veggies. Thanks for a keeper recipe!! Toni, YAY!!! I’m so so pleased to hear this. I bet it was super yummy with the asparagus also. Thank you for trying the recipe and stopping back by to leave this review! I’m always on the lookout for a good tasting whole wheat pasta! I have yet to find one and now I need to try this brand! The Italian in me is very picky about my pasta :) Love this dish and it just may be my new go-to also! Looks like a deliciously big plate of everything I crave, especially the healthy bites of whole wheat pasta. I can totally see this on any weeknight menu. I always use whole grain pasta – I like it so much better! I’ll have to find that brand, it looks amazing. This dinner is one that could get me in trouble, I wouldn’t share it. All my favorite flavors in one place! Yep, totally my king of pasta!! We made this over the weekend, and it was amazing! Even my picky husband went back for seconds. Thanks for a great recipe Erin!! Laura, I am so excited to hear that you loved this pasta, especially since it was one of your first times using whole wheat! Thanks so much for trying the recipe and letting me know how it turned out for you. You don’t have to twist my arm – this looks like the perfect weeknight dinner! Creamy. Chicken. Bacon. Pasta. Four of my favorite words in one dinner? I’m sold! Tried this Monday night and everyone loved it. It did not reheat well though. The pasta was gummy and the sauce was kind of clumpy. I would make it again but only if I had a larger crowd to feed and wasn’t trying to make something with leftovers for later in the week. Jessica, I’m so happy you enjoyed this recipe! We had good luck reheating it by putting it in individual serving bowls, topping it with a little extra chicken stock and splash of cream, then microwaving it gently. I’m sorry the leftovers didn’t work out as well for you—I know it’s too late to save them now, but if you do try the recipe again, I hope this tip is helpful. What is half and half? I’m in Australia and haven’t heard of this. What can be used to replace it? Suzan, half and half is a dairy mixture that is half whole milk and half full fat, heavy cream. If you don’t have half and half available, you can either make your own mix or use all cream. I hope you enjoy the recipe! Made this for dinner last night and it was very good. I liked the way the bacon flavor popped up every so often. I wish that one could just throw the pasta into the skillet and cook everything all at once, because where I am right now I have a very limited kitchen (electric skillet, blender, microwave). There is a real kitchen upstairs in this house and my husband cooked the pasta for me up there, for which I bless him. This recipe is a definite keeper. That recipe is already on my list of recipes to try. ? I just made this recipe and it was amazing!!! I’ve been sick with the flu for the last 3 days but actually wanted to cook for my boyfriend something that was good and easy and this was perfect!! Thank you so much!! Hi Mary, it’s a mixture of half whipping cream and half whole milk. I find it in the dairy section of the grocery store by the heavy whipping cream and coffee creamers. I made this recipe for my fiance and I for dinner, and it was amazing! I even used low sodium bacon and fat free half and half, but you could never tell. We will definitely be making this again. I have it for lunch today and can’t wait for my lunch hour! Justine, I’m so happy to hear you enjoyed the recipe! Thank you for taking the time to share your tweaks and to leave this wonderful review! Hi what is half and half? Hi Martina, half and half is an mix of half whole milk and half cream!